Presented to the Commonwealth by the French after World War One, the cannon was allocated to Childers as a lasting memorial to World War One. Following World War One, the Queensland State Trophy Committee decided to issue war trophies based on the population of ‘the township proper’. As only 38 guns were available for distribution across the state, based on this criteria Childers was not considered eligible to receive such a large war trophy for its proposed War Memorial. In 1918 then Shire Clerk Howard Epps requested ‘two at least Field Guns with carriages, with which to adorn the memorial when erected’. In 1920 the offer of a machine gun was considered by Epps and the Council as ‘absurd’ and the Council again requested ‘at least two guns with carriage and limber be allotted to Childers’. Epps argued that Childers was the centre of a large sugar growing area and of the 360 men who enlisted from the area, 56 would never return home. Some success was obtained on 14th March 1922 when a Field Gun was assigned to Childers. On 25th April 1926 a Soldiers Room complete with Honour Boards was opened in a building shared with the Isis Shire Council, but hopes of a matching gun did not materialise and the cannon continues its sole vigil. The Howitzer deteriorated from exposure to the weather over many decades. 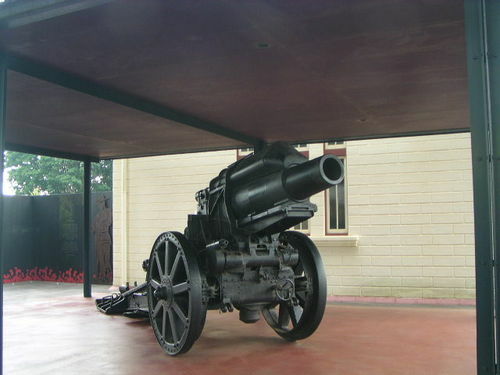 In the late 1990s the Isis Shire Council, the Rotary Club of Childers, the Lions Club and the Returned Service League, undertook a joint endeavor to restore the gun .